The Indigenous People of Biafra’s (IPOB’s) September 14, 2018, sit-at-home order received a boost yesterday as 12 Igbo groups met in Enugu and endorsed the move. The meeting, held at the residence of Deputy Leader of Eastern Consultative Assembly (ECA), Chief Maria Okwor, was attended by traditional rulers, trade associations, youth groups and student organisations. 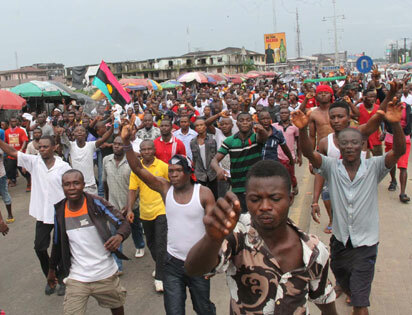 Okwor, who convened the meeting, said the decision to support the sit-at-home order followed the humiliation meted out to Igbo women recently during a peaceful demonstration in Owerri against the way democracy was being run in the country. She, therefore, called on Ndigbo to sit at home on September 14, 2018, to express their frustration with Nigeria, adding that Nigeria should be returned to the 1963 Constitution for it to survive. Bringing so-called Python Dance 3 to our peaceful region now is only designed to deliberately provoke a confrontation that will lead to loss of lives as they did last year”. Ugochukwu-Uko announced that the emergency meeting, therefore, asked all Ndigbo who are aggrieved over the endless provocative and humiliating invasion to stay indoors on Friday, September 14, 2018, to send a message to the world that they are angry. The meeting also resolved to send a message to the United Nations (UN) that Nigeria would die if the structure was not returned to the 1963 Constitution, adding that it would organise a street march in October to drive home their demand for a new constitution.